When I was little, I was asked a riddle, “What is the beginning of eternity, and the end of time and space?” See the end of the post for the answer. I also noticed that the LORD was L’Éternel in French, my grandfather’s language. In German, the LORD is Der Ewige. I finally decided to track this down. Here is Exodus 3:13-15 in several different translations, Hebrew, Olivétan 1535, Luther, 1545, and Mendelssohn, 1780 and finally Buber-Rosenzweig. Qui est son nom? Que leur dirai–je? Je suis m’a envoyé vers vous. et le mémorial de moi au siècle des siècles. ICH WERDE SEIN hat mich zu euch gesandt. dabei soll man mein Gedenken für und für. Ich bin das Wesen, welches ewig ist ! hat mich zu euch gesendet. It seems that Olivétan was the first to use “L’Éternel” in a Bible translation and Mendelssohn followed that. 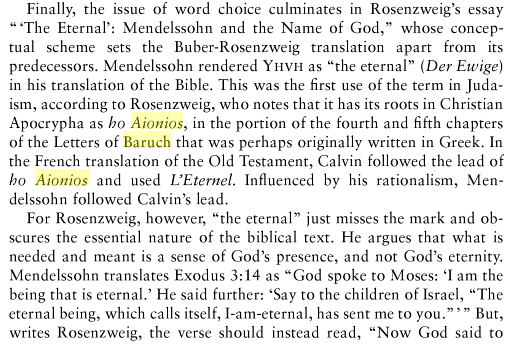 However, he also wrote about the expression ho Aionios in the the Letter of Baruch. 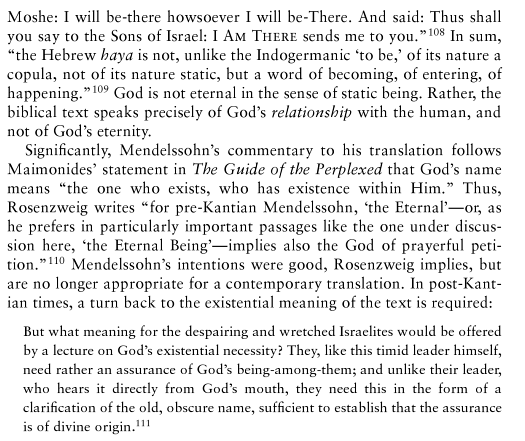 Here is a discussion of Rozenzweig’s response to the use of Der Ewige for God. Delightful – Every time I turn around there is that time-space construct to deal with. I like to see it disappear into the presence. the LORD was L’Éternel in French, my grandfather’s language. So I’m curious whether this is a regional/dialect difference, or whether it was contextual: in your grandfather’s French, was the Lord *always* L’Eternel, or only in some contexts? It is much simpler than that. My grandfather was Protestant, from near Geneva, and all Protestant Bibles in French have always used “l’Éternel” since Olivetan introduced the expression in 1535. Le Seigneur is “our Lord” that is Jesus Christ, but God is “L’Éternel.” It is the translation for Yahweh. For Luther God was der HERR, but Medelssohn used der Ewige, or das Ewig Wesen. 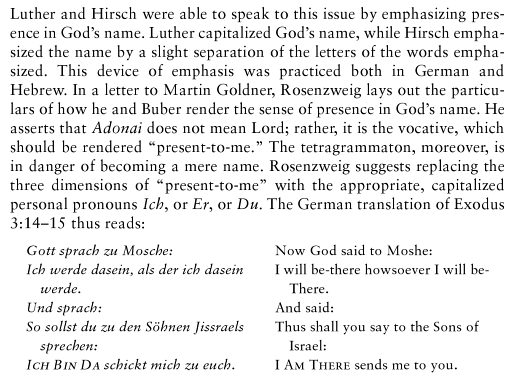 Then Buber and Rosenzweig used “Ich Bin Da.” I am there. 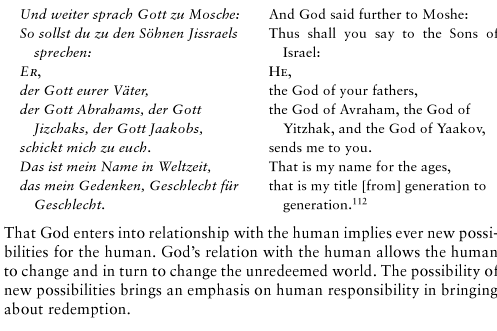 You are playing with Rosenzweig’s problem, Is God the one who is eternal or the one who is present? He chose ICH BIN DA, but he did think the Eternal God was an improvement over the LORD God.